Pardon the Punctuation...For my two year anniversary I decided to attempt to make a last minute reservation to Ink restaurant on Melrose. Michael Voltaggio of "Top Chef" fame, has brought Michelin star quality and service to Los Angeles without the usual Michelin star highbrow. After making a reservation online at OpenTable I called ahead to see if anything earlier had opened up. Diana the hostess answered the phone like a breathe of sunshine and let us know that we were going to have her favorite table for our dinner. Upon arriving, Diana treated us like family. This let us know we were in for a special night. Any special dinner calls for a special bottle of wine. 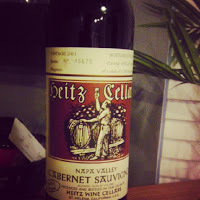 A bottle of 2001 Heitz Cellars Martha's Vineyard Cabernet was at peak and perfect for the night. Our waiter Ben continued bringing the great servicer after we were seated. He recommended we do three plates each since we did the À la carte choices for the menu. If you go, two plates a piece is plenty...we were stuffed after our six plates...no bueno. We ate a lot so I'm going to break this down in a list in the order we received the din din. La Quercia Bershire Ham with Manchego biscuit and Marcona almond butter: The biscuit was perfectly flaky with a slight hint of manchego in it. If the La Quercia Berkshire Ham was referred to in a rap song it would be called,"Off the chain." You must order this if you go. Beef Tartare with hearts of palm, sea bean chimichurri, horseradish, and rye: I still can't get over how the chef pulled all of the flavor out of the horseradish while getting rid of the heat. Exquisite is the only way to describe the rest of the ingredients. Brussels Sprouts with pig ears, lardo, and apple: When the dish arrived it looked they brought me Medusa's head on a plate. It was like a scene from "Clash of the Titans." The sprouts were crunchy, bitter and perfectly seasoned. The lardo was a mouth watering compliment to the pig ears and just melted in your mouth. Grilled Octopus with house made ink shells, young fennel, and pimenton: There are only two places on this side of the Atlantic that I have had perfectly grilled octopus and this one of them. I could have just ordered two orders of this and called it a night. Just the perfect tenderness in the texture and char flavor in the octopus. The octopus ink pasta shells were to die for and could be sold as a dish on their own. You must order this if you go. Pork Belly with charcoal oil, bbq flavor, and corn: As far as I'm concerned, pork belly is the new "black" and I'm never going to get tired of it. They could have served this without a knife You must order this if you go. Wagyu Beef with carrots, tendon, and horseradish tofu: Tender, flavorful, and crunchy is the best way to describe this dish. We were stuffed by the time we got it and I couldn't get myself to stop eating it. The tendon was fried and tasted like a classic pork rind. Overall a very good dish. Apple with caramel, walnut, and burnt wood ice cream: This was art on a plate. Never would I have thought that a craving for burnt wood ice cream would be in my future. They literally burn wood to a crisp and infuse it's flavor with the ice cream. If I was ever on "Death Row" this would be part of my final meal. They freeze the ice cream with liquid nitrogen and you have to crack open the ice cream shell to get to the apple. One of the top five desserts I've ever had. You must order this if you go. "Ink" is a home run of a restaurant that will leave you smiling and begging for more. Chef was kind enough to sign the menu for me and complete the perfect anniversary dinner. I have a feeling this won't be the last time they see my face at their establishment.